Beo! - An bhfuil athrú rialtais i ndán do mhuintir na hAstráile? An bhfuil athrú rialtais i ndán do mhuintir na hAstráile? Ní minic a thagann athrú ar rialtas náisiúnta na hAstráile, ach táthar ag súil go mbeidh ré an chomhrialtais reatha thart tar éis an chéad olltoghchán eile, a deir Bearnaí Ó Doibhlin. 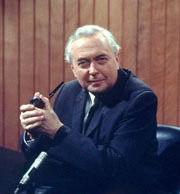 Harold Wilson: "A week is a long time in politics." Faoi dheireadh thiar thall, tar éis bliana fada de “fheachtas bréige toghchánaíochta” - mar a táthar ag tabhairt air - a chur dínn, beidh olltoghchán ar siúl san Astráil ar an 24 Samhain. Mar is iondúil, beidh toghchán ar siúl le haghaidh na suíochán go léir i dTeach na nIonadaithe agus le haghaidh beagán níos mó ná leath na suíochán sa Seanad. Faoi láthair, tá tromlach na suíochán sa dá theach ag an rialtas reatha, comhrialtas atá comhdhéanta den Pháirtí Liobrálach agus den Pháirtí Náisiúnta. 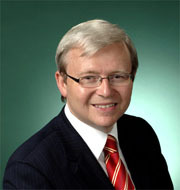 Cuireadh tús leis an "bhfeachtas bréige" ón uair a ceapadh Kevin Rudd mar cheannaire ar an bhfreasúra - ar a dtugtar an Australian Labor Party (ALP) - i Nollaig na bliana seo caite. Thosaigh an feachtas ag bailiú nirt nuair a léirigh pobalbhreitheanna go raibh an tUasal Rudd ag dul i bhfeidhm go mór ar mhuintir na hAstráile. Thug baill den chomh-aireacht le fios i dtosach nach raibh i gceist ach tréimhse chneastachta, mar a tharlaíonn go minic agus ceannaire nua díreach ceaptha ag páirtí polaitíochta. Ach nuair a thaispeáin go leor pobalbhreitheanna eile gurbh fhearr le muintir na tíre Kevin Rudd ná John Howard mar phríomh-aire, chuathas i mbun ionsaithe pearsanta ar cheannaire nua an fhreasúra. Cuireadh an-bhéim sna hionsaithe seo ar chomh gearr agus atá taithí pharlaiminte Rudd, agus ar a easpa taithí rialtais. D’ainneoin na n-ionsaithe, beidh lámh in uachtar ag Kevin Rudd san olltoghchán, de réir gach pobalbhreithe le bliain anuas. Más fíor na cinn is déanaí, leoga, bainfidh an freasúra ollbua amach. Agus dealraíonn sé anois go bhfuil an príomh-aire é féin, agus cuid dá chomhghleacaithe sa chomh-aireacht, i mbaol a suíocháin a chailleadh. ConstaicíFeictear dom, áfach, go bhfuil constaicí móra le sárú ag Kevin Rudd má tá sé chun a bheith ina phríomh-aire. Sa chéad dul síos, teagmhas annamh go maith a bhíonn ann má thagann athrú ar rialtas náisiúnta san Astráil. Ón mbliain 1949, níor tháinig ach ceithre athrú ar an rialtas náisiúnta, cé go raibh 23 olltoghchán ar siúl i rith na tréimhse sin. Mar gheall air seo, deirtear san Astráil nach mbuann an freasúra an t-olltoghchán, ach go gcailleann an rialtas é.
Ina theannta sin, tá tromlach mór ag an rialtas sa teach íochtarach faoi láthair. Tá 150 suíochán sa teach, agus níl ach 60 acu siúd ag an ALP. Dá bharr sin, beidh ar an bhfreasúra sé shuíochán déag sa bhreis a bhuachan le móramh a bhaint amach - agus níor tharla a leithéid riamh in olltoghchán san Astráil. Tá buntáiste an-mhór freisin ag an rialtas maidir le cosaint na suíochán imeallach. Baineann polaiteoirí úsáid as cleas ar a dtugtar “pork-barrelling”, agus tá an cleachtas seo faoi lán seoil san Astráil le tamall anuas. Mar shampla, i gcás suíocháin amháin in aice linne, tá mórthionscadail éagsúla chaipitiúla sa toghcheantar atá á maoiniú ag an rialtas. Tá iarrthóir de chuid an rialtais reatha ag maíomh gurbh eisean ba chúis lena mbunú. De bharr go bhfuil an geilleagar an-láidir, tá ciste mór dubh ag an rialtas agus ní bheidh scrupall dá laghad orthu úsáid a bhaint as chun a leasa féin. Cleasa toghchánaíochtaChomh maith leis sin, tá taithí fhada ag an bpríomh-aire maidir le cleasa toghchánaíochta. Tá ceithre olltoghchán i ndiaidh a chéile buaite aige, agus tá a chomh-aireacht i mbun rialtais le beagnach dhá bhliain déag anuas. 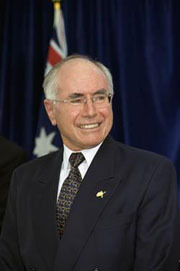 Chomh fada siar leis na seachtóidí, bhí John Howard ina aire sa rialtas náisiúnta, seal amháin a chaith sé mar chisteoir san áireamh. Trí bliana ó shin, díreach roimh an olltoghchán deireanach, bhí an tUasal Howard i bponc, de réir na bpobalbhreitheanna. Ach bhain sé sárúsáid as bearta scanraithe le heagla a chur ar vótálaithe comhlúthacha a raibh sé ar intinn acu tacaíocht a thabhairt don ALP. Is dóigh liom go mbainfidh sé triail as an oirbheartaíocht chéanna an babhta seo, ag maíomh go ndéanfar praiseach don gheilleagar má éiríonn leis an ALP san olltoghchán. Faoi láthair tá an ALP i mbun rialtais i sé stát agus dá chríoch san Astráil. Dá n-éireodh leo móramh a bhaint amach ag leibhéal náisiúnta, bheidís i gcumhacht i ngach parlaimint sa tír. Measann daoine áirithe go mbeidh drogall ar mhuintir na tíre an oiread sin cumhachta a thabhairt do pháirtí amháin. D’fhéadfadh sé tarlú do dtabharfadh muintir na tíre tacaíocht don dá pháirtí atá sa chomhrialtas reatha chun cothromaíocht na cumhachta a chosaint. É sin ráite, tá údair éagsúla dhóchais ag an ALP. Tá ceannaire nua fuinniúil acu agus, de réir dealraimh, tá na baill uilig dá pháirtí ar aon intinn lena chéile maidir le tacaíocht a thabhairt dó. Is fear measartha óg é Kevin Rudd, a bhain leathchéad bliain amach ar na mallaibh, agus tá an chuma ar an scéal go bhfuil sé i mbarr a mhaitheasa. an-tábhachtach i gcúrsaí polaitíochta agus táthar ag cur béime ar cheannaireacht úr agus ar an todhchaí i mbolscaireacht de chuid an ALP. Caidreamh tionsclaíochÓ thaobh na bpolasaithe de, níl ach mórábhar amháin a bhfuil na vótálaithe ag cuimhneamh go háirithe air, de réir na bpolalbhreitheanna: an caidreamh tionsclaíoch. B’fhearr leis an rialtas go mbeadh aird an phobail dírithe ar bhainistiú an gheilleagair, ach is ríléir go bhfuil aird á díriú ar na dlíthe nua caidrimh thionsclaíoch a chuir an rialtas i bhfeidhm anuraidh. Le blianta fada, bhí sé ar intinn ag John Howard tús a chur le ré nua maidir le caidreamh tionsclaíoch san Astráil. Nuair a bhain sé móramh amach sa Seanad san olltoghchán deireanach, thapaigh sé an deis chun reachtaíocht nua a chur tríd an dá theach. “Work Choices” an teideal atá ar an reachtaíocht seo, faoinar féidir le fostaithe dul i mbun idirbheartaíochta lena bhfostaithe maidir lena gconarthaí aonair fostaíochta. Glacadh leis an gcur chuige seo in ionad an chórais cómhargála a d’úsáidtí sa tír roimhe sin. “Australian Workplace Agreements (AWAs)” a thugtar ar an gcóras nua, agus mar a bheifeá ag súil, bhí na ceardchumainn glan in aghaidh na reachtaíochta nua seo. cothrom na Féinne á thabhairt ach go háirithe do na daoine is leochailí sa tír - iad siúd a bhfuil post ar phá íseal acu. Bhí baint láidir ag na ceardchumainn le cothú an dearcaidh sin, agus beidh caidreamh tionsclaíoch anois ag croílár fheachtas toghchánaíochta an fhreasúra. Tháinig na ceithre athrú ar rialtas náisiúnta na hAstráile a luaigh mé cheana le linn dúinn a bheith abhus. Gach uair a toghadh rialtas úr, léirigh muintir na tíre roimh ré gur mhian leo athrú a fheiceáil. Measaim go bhfuiltear ag léiriú na méine céanna sa tír faoi láthair. Dá bhrí sin, is dóigh liom go mbeidh an lá ag an ALP ar an 24 Samhain. Ach mar a deir an seanfhocal, “ní breac é go mbeidh sé ar an bport”. Agus mar a dúirt iar-phríomh-aire na Breataine, Harold Wilson, tráth, “A week is long time in politics”.